A series of rugged, compact, multi-format professional IRDs, the Falcon HMR5440 and Falcon HMR5442 professional video receivers are used in broadcast contribution and distribution applications where multiple video formats (SD and HD), interface flexibility (Satellite and IP) and content protection (BISS) are required. The Falcon HMR series offers an unprecedented combination of features, performance, and reliability at an industry-leading value. Both versions of the Falcon HMR support SD and HD resolutions, and MPEG-2 and MPEG-4 decoding. The Falcon HMR5442 adds 4:2:2 functionality in MPEG-2 and MPEG-4, including 10 bit 4:2:2 in MPEG-4. The Falcon HMR5442 also includes full 1080p 60 decoding and output along with support for AAC audio. The Falcon HMR series is a perfect complement to DTVI’s Gryphon series of MPEG Video Encoders.. The Falcon HMR5440 and Falcon HMR5442 support all common HD and SD video formats. Multiple video output formats are supported including: analog NTSC and PAL, and digital SDI for standard definition; and HD-SDI and component video for high definition. The Falcon HMR5442 adds support for 1080p50/60 3G-HD-SDI and HDMI. Video processing is automatically sensed by the decoder and processed as either MPEG-2 or MPEG-4, SD or HD. Included in the basic functionality of the Falcon HMR5440 is video resolution conversion from HD to SD, and from SD to HD, and aspect ratio conversion from 4:3 to 16:9 and from 16:9 to 4:3. 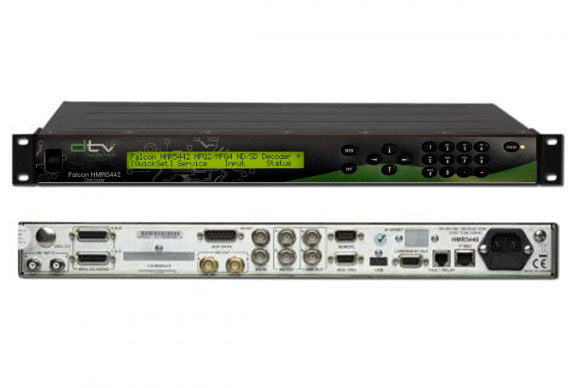 Both Falcon HMR models decode up to eight audio channels (four pairs) with analog and digital outputs, and embedded within the SDI or HD-SDI video signal. Either Falcon HMR may optionally be configured with internal frame sync for Genlocked applications. Unlike competitive products, correct lip sync is guaranteed—even while operating in frame sync mode. Both Falcon HMR models are highly flexible and offer various input interfaces including ASI, DVB-S, DVB-S2, or MPEG TS over IP. The Falcon HMR family provides an embedded Web browser, an intuitive front panel interface, or RS-232 command line interface for easy configuration and monitoring.